Metro Merchant Services is a Delaware-based merchant account provider that offers payment processing services to businesses in the United States and Canada. They are an ISO of Wells Fargo Bank, and they utilize the First Data network for payment processing. This particular company was created in 1997 by a single founder, Mark Landis, who ran the business on his own, until later growing into a fully staffed business. Metro Merchant Services offers payment processing to companies in the retail, mobile, restaurant, non-profit, and E-commerce industries. Their services include card processing, a virtual terminal for online transactions, wireless payment processing, ACH processing, POS equipment sales and rentals, and ATM placement. Rather than rely on a unified, but sanitized, business face to interact with merchants, Metro Merchant Services relies on independent salespeople, who obtain new clients, and offer those clients ongoing customer service throughout their time with Metro Merchant Services. Unfortunately, information on Metro Merchant Services’ pricing is hard to find. Their website simply informs visitors that prices vary due to the nature of individual accounts, and to call for quotes. Because Metro Merchant Services are closely connected to First Data, it’s likely safe to say that their prices will fall into the same upper range as First Data’s. You will likely see a contract with an early cancellation fee. Metro Merchant Services is also woefully lacking in any clear information on their application process, including how long it takes. With a brief mention of “just a few days,” it would appear that their accounts take slightly longer than industry average to get started. They do allow the acceptance of gift cards, loyalty programs, EBT, ECP, and many other types of payment. All reporting is web-based, and they offer a 24-hour support team for technical issues with your equipment. Another service that Metro Merchant Services offers is cash advances for businesses that have over $80,000 in annual sales. These advances can be approved and delivered in two days, and seem to carry no collateral requirements. For a business that already gets payment processing services through Metro Merchant Services, this may be an interesting program to take advantage of when your business is in need of an expansion, new inventory, new advertising, remodels, or various other emergencies. Metro Merchant Services seems to be focused very heavily on customer service, relying on their independent salespeople to truly drive home their mission to be the best in customer service in the payment processing industry. To that end, they have an informative blog and phone, fax, and online message submission system for easy customer support. 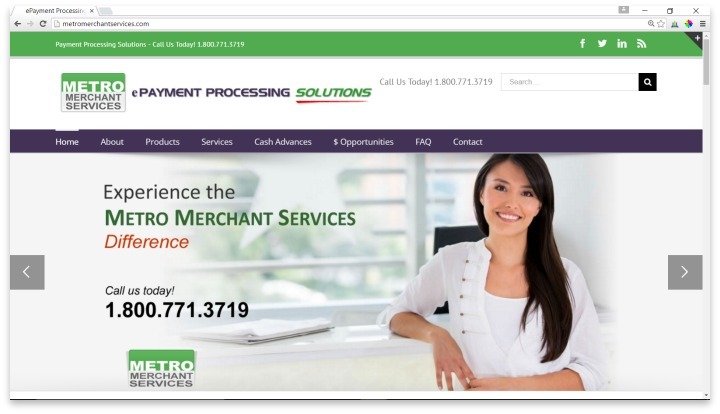 Metro Merchant Services offers payment processing, credit card processing, wireless payment processing, ACH processing, POS equipment sales and rentals, ATM placement and cash advances. It’s hard to judge whether Metro Merchant Services would be a good fit for a large business. If you are a small, rural business, you value the face-to-face relationship with a single sales representative, and you have the time to discuss and negotiate your rates over the phone, then Metro Merchant Services may be worth checking out. Their services are far more about the benefit of face time with the service representative than any other benefit, however. If you want to save time, know what you’re getting into ahead of time, and you want the most up-to-date technology there is, Metro Merchant Services is probably too outdated to serve your needs. Metro Merchant Services is a Delaware-based merchant account provider that offers payment processing services to businesses in the United States and Canada. Metro is outstanding! I love these guys. No more wondering if we have the best deal (lowest costs) when it comes to payment processing. They do detailed analysis and show you in writing what the savings are regardless of who you are up against. I suppose you may find lower rates somewhere, but not by much that for sure. Regardless, the quality of their customer service alone is enough to keep my company as a happy customer. Very seldom have I ever called and not been talking with a live person within one minute. - CONS: None that I can think of. We’re a nonprofit and Metro Merchant Services has taken very good care of us for years. They genuinely care for there customers and no other company can come close to their rates. They did pretty much everything to set things up for us and we have been happy every since.